- Elsa Punset confirms the relationship between solidarity and happiness given in human beings. - Only 18% of the Spanish population collaborate with one or several NGOs, a number three times lower than the levels achieved in the United Kingdom or France. Of these, only 8% do so regularly. - Ana Duato, Ana Pastor, Antonio Carmona and Jon Sistiaga invite everyone to celebrate the Day SOMOS (which means WE ARE in English) (June 8th). 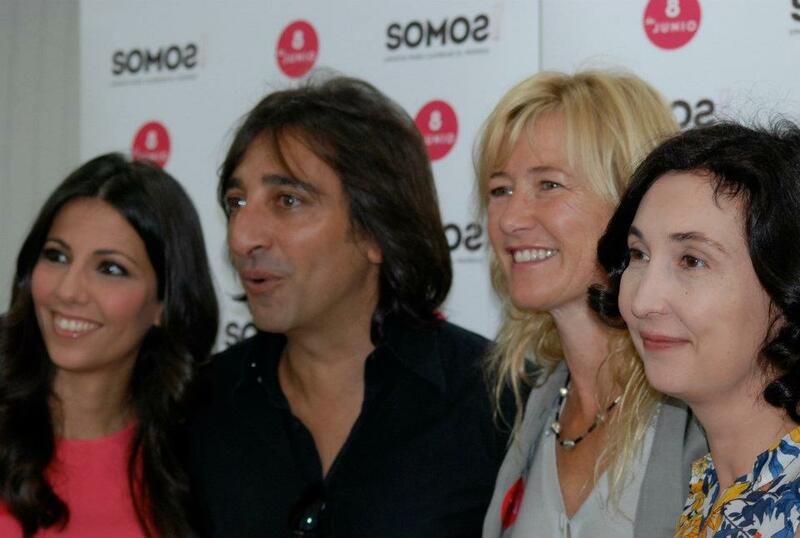 SOMOS, is a solidarity campaign in which the José Carreras Foundation participates, as well as other Spanish NGOs. We have all joined to promote solidarity and to try to change the world. The main objective of the SOMOS campaign is to promote the culture of solidarity and to thank the 3 million regular partners in Spain for their economic contribution to non-profit-making organizations (more than 31,000 collaborate with the José Carreras Foundation in the fight against leukaemia. Thanks!). This campaign also aims to, through the current partner's testimonies; increase the social base of the NGOs. 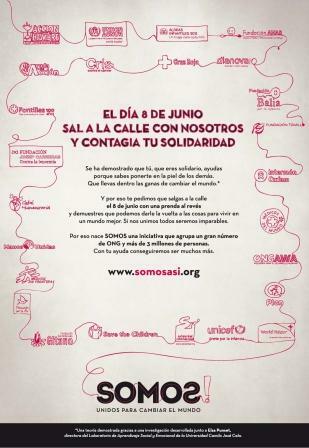 One of the highlights of the campaign is the Day SOMOS (June 8th), where we invite the Spanish society to show their commitment with the NGOs, and where it will be clear that solidarity is worth it. As Carmen Gayo, AEF's President, has said, "It will be a day to pay tribute to the NGO members. We want to encourage them to tell their family and friends that they collaborate regularly with an organization and this way, inspire these to pick their cause and collaborate as well". The idea is to repeat this action every year to thank and honour the NGO members. "Altruism is both innate and learned. We are born empathic, with the capacity to put ourselves in someone else's skin and to suffer and enjoy with them and we can learn to enhance this capacity, or contrarily, drown it. Social models who demonstrate altruistic behaviours help a lot in society", affirms Elsa Punset, Director of the Laboratory of Social and Emotional Learning at the University Camilo José Cela. Punset has conducted a study to test the hypothesis of human solidarity through a 10 question questionnaire, which has been answered by more than 40,000 people in our country in very few days. Within the conclusions she points out that the best moments of happiness in people are related with solidarity and affective relationships. "In times of crisis, where we see that governments don't have time to achieve everything planned, it is essential to awaken the ability of the people in our society to actively help. We need each other and every day more because we are more, and to survive and prosper we will need to collaborate more", Punset adds. Spain is a country that believes in solidarity. Before the images of a major disaster, like the one in Haiti two years ago, we got very involved. In very few weeks, more than 50 million euros were collected, becoming the third country in the world to provide the most additional private funds to Haiti. But although it is very impressing the way the Spanish society reacts to a tragedy, it is necessary to encourage an ongoing commitment to enable us to address some type of situations in our country and beyond our borders, which are not represented as much in the media. That is why NGOs need financial support from partners committed every day. In Spain there are about 3 million members who contribute regularly to an NGO. This represents an 8% of the adult population. To them, we can add a total of about 4 million who make a momentary donation, and therefore, in total, 18% of the adult population collaborates economically with NGOs. The proportion of donor population in Spain is more than 30% below the average of other European countries. For example, in Britain 58% of the population donates, in France 49% and in Italy 43%. BECOME A MEMBER OF LEUKAEMIA'S HEALING. THANK YOU!